In USA or Europe if you want to keep bees you need to buy them. In Africa the bees come to you! An African beehive can swarm up to 10 times in one year. Your goal is to prepare hive boxes and bait those hives to attract the swarms to reside there. This means that your hives should be baited just before the high fly time and placed directly in the forest at the very beginning of this time. It is counterproductive to put your hives out at any other time. Since there could be several swarming seasons each year (depending on the climate and vegetation where you are located) African bees may occupy hives at different times of the year. The area you do beekeeping in will be different from others. One thing that characterizes the swarming season is that there will be an abundance of flowers blooming at once and not isolated species by themselves. During this time, crowded bees realize that they must make room for honey and pollen stores to be brought in. A new queen is produced by the hive and this triggers a swarming impulse in the hive. Bees used these two types of wild flowers in the month of May to gather nectar in the Rukwa region. Beekeepers refer to these types of plants as bee fodder. A portion of the workers from this hive will swarm with the old queen. It can be a very large amount of bees, up to half of the colony. Sometimes 20,000-30,000 bees will swarm. This first swarm is called a primary swarm. This primary swarm is the most desirable swarm to occupy your hive. It is also the most numerous of the swarms that will issue forth from that hive in the year. Secondary or tertiary swarms will not have near the amount of bees that the first swarm has. If you do not get primary swarms you will be at a distinct disadvantage in your beekeeping. 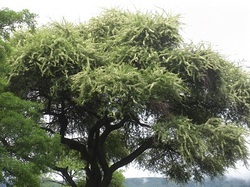 Blooming acacia. This variety makes strong tasting honey and the bees only can get its nectar in the early morning hours. A well baited hive like this one, put out at the proper time, will attract primary swarms. This primary swarm is even now entering the hive. It will slowly enter the hive, taking its time until all members of the colony are inside. This is a 25-bar Top Bar hive. Most hives should be 20-25 bars long to start. 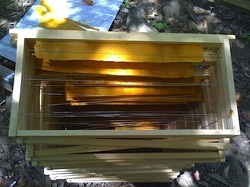 Once the colony grows these bars can be transferred into a 30 or even 40-bar hive, if your colony should grow that big. This is an exceptionally large occupation. A Log Hive needs wax smeared on the inside top of the hive. If a Top Bar, the wax should be brushed sparingly on the inner sides and then starter strips of wax placed in the grooves of the bars. Note: A thin veneer of plywood can be inserted in the groove of the top bar instead of wax starter strips. These strips of plywood can then be dipped in liquid wax for the same effect. If a Langstroth, the wax should be brushed sparingly on the inner sides of your hives and starter strips should be attached to the top of the frames (see picture below). 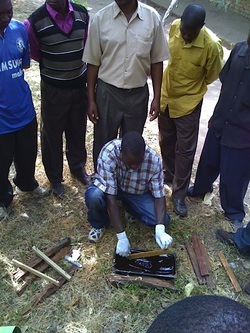 Most beekeepers in Africa have no availability of wax foundation and therefore have to make due with starter strips, which work just fine for African bees. These wax starter strips are easy to make and fix to your hives with minimal equipment. Preparing a coffee wire queen excluder for a Top Bar hive. The purpose of a queen excluder is to keep the queen in the brood chamber. Since the spaces between the coffee wire are 4.5 mm it allows the passing of workers but excludes the queen. The benefit this provides is pure wax comb with no brood whatsoever in the honey chamber. Materials needed: Four hard wood boards of 3 inches by 13 inches, eight 3 inch screws, a shallow pan 8 inches wide by 16 inches long by 4 inches tall. Screw two screws into the tops of each board while they stand on end. These screws will act as dipping handles for the boards. Put the pan over a low fire and melt wax in the pan until it becomes liquid and fills the pan up to 2 inches. Soak your boards in water (by absorbing water, wax will not stick to the sides of the boards as much). Dip your screwed boards into the liquid wax 6-7 times, each time letting it dry and cool before re-dipping, until a good amount of wax sticks to the sides of your boards. Finally, peel the wax from the boards with a sharp knife. You should have a thin strip of wax 2 inches wide and 13 inches long. This is your starter strip to affix to the groove in your bar or frame. The bees that occupy your hive will build their comb on this starter strip. Important! It is important to observe something called bee space in the construction of your hives and placement of your starter strips. Bee space simply is the crawl space needed by a bee to pass easily between two structures. If the space is too small the bees will fill it with propolis (bee glue); if it is larger than a bee needs, the bees will construct comb in the area. When the space between two surfaces of the hive is the right size, the bees will leave it free as a crawl space. If the bee space is considered in the construction of the hive and placement of the starter strips, it will allow for easy comb removal for inspection and harvest of honey. African bees build very precisely and it is imperative that the space between wax starter strips in your hive be 32mm wide. This will leave enough room for the building of comb as well as a crawl space for bees. All the other measurements on your hive are very flexible but the width of the top bars in a Top Bar hive, or space between your starter strips in a Langstroth must be 32mm. If bee space is not observed, bees may affix their comb perpendicular to the bars or frames! You will understand the importance of bee space after finding your first burr combed hive. Here Stewadi demonstrates how to prepare starter strips. First dip your board in wax. Dip in hot wax and let cool 6-7 times before taking it off the board with a sharp knife. 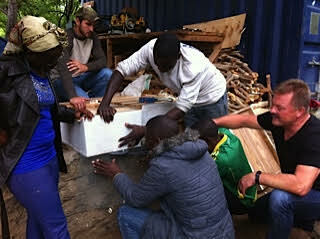 In this picture Stewadi is fixing the starter strips of wax to the top bars of a Top Bar hive. These starter strips are affixed to Langstroth frames. Starter strips are necessary in all Top Bar and Langstroth hives to ensure the bees pull their comb where the beekeeper wants them to! Where should you locate these hives you have made? Your goal undoubtedly will be honey production and output! To meet your goal you must have the right conditions. There are really only 2 things needed in finding the right place to locate your hives. There must be a source of water all year long, and a source of nectar bearing trees or flowers. If you have water and flowers nearby, it will be enough for you to get a good supply of honey. Putting your hives in a safe place is extremely important! In contrast to their European counterparts, African bees should always be situated 100 meters from homes, schools, roads or any areas that people frequent. Some hives of African bees are mild and others are more aggressive. We have many hives that are passive and permit us to walk past the entrance, even during nectar flows. African bees tend to be more aggressive during nectar flows while protecting their stores of honey and pollen. It is hard to gauge whether your hives will be aggressive or passive but during harvest and inspection, all will get aggressive. Position them in an area away from people. There are threats to your hives. We have found that the biggest threats are people, fire ants (siafu) and honey badgers, in that order. Depending where you live you will be challenged by all three of these threats. We recommend hanging your hives in trees by easily removed wires, cables, or rope. Attach a hook of some sort on which to hang your wire support. Greasing the hook will prevent ants from getting to your bees. They will not cross the glob of grease. When inspecting your hives re-grease them to ensure you do not lose this line of defense. In areas where you have few pests and good relations with the local people, you can keep your bees on stands with the legs of the stands set in cans of oil. This also will keep ants from attacking your hives. 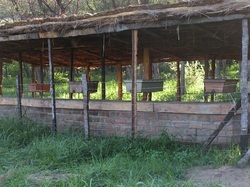 It is much easier to position your hives like this for inspection and harvesting. But often it is just not practical due to vandalism or honey badgers. An apiary is a area where many hives are placed. It is easy to harvest honey from such sites. All apiaries must have a good source water nearby, plenty of flowering trees and plants as well as be situated 100 meters from homes and schools. The Village Land Act passed in 1999 in the country of Tanzania is one of the most important legislative texts that support community-based natural resources management (Wily,2003). It empowers the community at local level (village), recognizing it as the appropriate representative structure to implement natural resource management. In view of this, through the village land-use management system, beekeepers can be allocated land for beekeeping development.